The Paris Marriott Hotel Champs Elysees, one the the best hotels in Paris, has finished renovating its spacious guest rooms, famous lobby and historic façade in November 2009. Located on the Avenue des Champs-Elysees, this five-star downtown Paris hotel is steps away from major city attractions such as the Arc de Triomphe, Eiffel Tower, Louvre and Orsay museums. 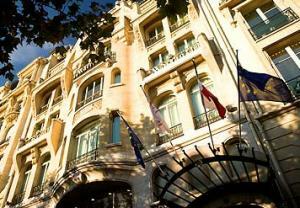 It is very close to luxury Paris department stores like the Galeries Lafayette and Printemps. This luxury Paris hotel offers upscale hotel rooms with flat screen televisions, wireless internet access and exquisite Marriott bedding. The hotel restaurant serves refined French cuisine seasoned with international exotic flavors. Guests can enjoy a relaxing atmosphere in the hotel’s atrium lobby for a break from a busy day of Champs Elysees shopping. Featuring business and catering facilities, business center, free fitness gym and sauna, the Paris Marriott Hotel Champs Elysees provides personalized service for magnificent Paris vacations.